Explore magnificent national parks and reserves on this exciting Kenya and Tanzania safari. 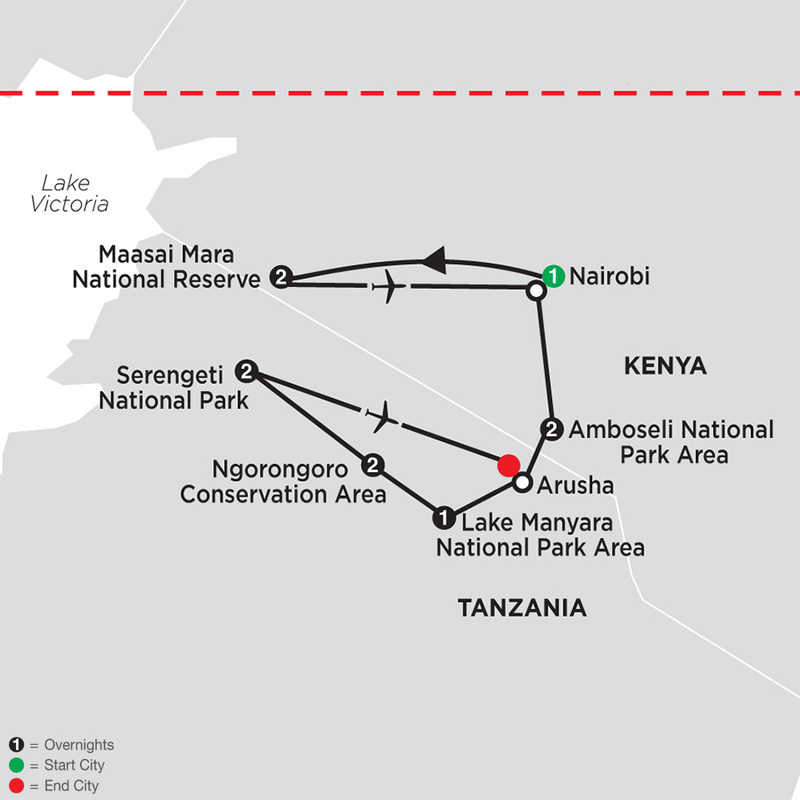 Your expedition begins in Nairobi as you depart for the Maasai Mara National Reserve-Kenya’s most famous game area. You’ll embark on morning and afternoon game drives in the "Mara"-home to lion, cheetah, leopard, hyena, wildebeest, and zebra. Next, explore Amboseli National Park-known for its spectacular views of 19,341-ft Mount Kilimanjaro. Here, you’ll enjoy morning and afternoon game drives in search of elephants, Cape buffalo, and more. Cross the border into Tanzania and journey to Lake Manyara National Park. Explore this ecologically diverse park on a morning game drive. In Tloma, visit a local school and a family home to learn more about the local culture. Your escorted African safari continues to the amazing Ngorongoro area-with its astonishing crater measuring 2,000 feet deep and spanning 102 square miles. Revel in the fantastic game-viewing vantage point to spot lion, hippo, elephant, and flamingo. Next, you’ll enter Serengeti National Park-site of the seasonal great migration of wildebeest, but a great game-viewing area year round. Covering 5,700 square miles, the Serengeti will thrill you with both morning and afternoon game drives with the chance to see Nile crocodiles, big cats, giraffes, and gazelles.